Jarrod D (Work): Kyle, my dude! You got anything on Cole Roederer? Loved the BA draft report on him and hes started off mashing. Was curious if you've heard anything. Miguel Amaya just cracked BA’s top 100 prospects list at 100. CaliforniaRaisin wrote: Miguel Amaya just cracked BA’s top 100 prospects list at 100. 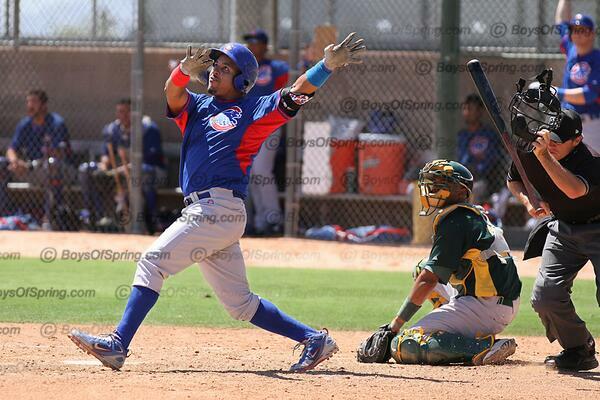 Warren (New London): Several high school players who got overslot deals are off to great starts in the Arizona League; Cole Roederer (Cubs), Raynel Delgado (Indians), Blaze Alexander (Diamondbacks) to name three. Is there any reason to change the evaluation of any of them yet? Are there any that you particularly like? I'm confused now. Roederer didn't have a really high pre-draft ranking and there was very little buzz about him (probably due to missing time from injuries). Like I read way more about Blaze Alexander before the draft. I'm glad he has a fan at BA. Yeah, that's odd to lump Roederer in with Delgado and Alexander. Certainly possible that Glaser was always high on Roederer, but that he was trumped by the other guys at BA, thus leading to a weak pre-draft ranking. Is it possible he was much higher pre-injury? Jimmy: Do you know if Eric has caught Cole Roederer live in AZ? Realize it’s a small sample but he’s putting up some pretty silly numbers. He’s currently got an OPS over 1.000 which in of itself is great but he also seems to be a legit CF. I’m curious if the scouting matches the results. That sounds reasonable. People who think he can really hit love him while those who are a little more skeptical think he's kind of a tweener. Would explain why he didn't get a ton of draft love but given our FO's strengths in identifying hitters I feel good about it. The in-laws live in Reading and surprised me with Reading Phillies tickets yesterday for my birthday. Got to see them play New Hampshire, so I got to see Vlad Jr in the flesh. Dude is massive. Made some nice plays in the field too. The top three hitters in their order were Bichette's kid, Biggio's kid and Vlad Jr so I felt pretty old. Great ballpark though. At one point I was getting beer and Phillies 2017 first rounder Adam Haseley just walked by me me to go into the clubhouse. Definitely an older park ha. I wonder what the corresponding move is there. MB has a full rotation and then some. Uelmen left yesterday’s Myrtle Beach game with an injury so there might be your opening. Well damn. I saw he left early, but was hoping it was more along the lines of a hugwatch type of deal. Miguel Amaya checks in at 97 on MLB.com's mid-season top 100 list. The Cubs handed out seven-figure deals to eight international prospects during the 2015-16 signing period, including $1 million to land Amaya out of Panama. They were attracted to his work behind the plate and his intangibles, traits that led them to promote him to the short-season Northwest League for his U.S. debut last summer. He was the league's best defensive backstop as an 18-year-old and this year has emerged as one of the game's best catching prospects, earning a spot in the SiriusXM All-Star Futures Game. With his agility and soft hands, Amaya is an advanced receiver for a teenager, framing and blocking pitches well. His arm strength is average but plays better than that because he makes quick and accurate throws, and he erased 41 percent of basestealers in the NWL. His arm strength has improved since he has signed and he could be a plus thrower once he's fully developed. Amaya is starting to make the same type of impact offensively, showing feel for the barrel and the ability to make consistent contact from the right side of the plate. He's doing a better job of waiting for pitches he can do more damage against, allowing him to tap into his power. He moves decently for a catcher but isn't a factor on the bases. Richan looks like a quality arm prospect, loose and projectable right now. Adam Warren-ish? Jared Young and Erick Leal were named the July minor league player and pitcher of the month, respectively. Some quotes and quick info on Cubs' draft picks Cole Roederer and Kohl Franklin in the link above. Despite being from Los Angeles, Cole’s favorite player is Bryce Harper. He laughed as he said it on the phone, but in all reality it makes sense that a hard-hitting outfielder from the West Coast would idolize a hard-hitting outfielder from the West Coast. Those roots led him to choose one school that he planned to attend before being selected last month. His favorite player is Bryce Harper huh? Nice. He grew up a Dodgers' fan (which isn't surprising), but his brother is a "diehard Cubs fan". He mentions the workout at Wrigley and how there were 12 or 13 guys there. I know we know some of those names, but I'm curious about the full list of invited players. I feel like I am 10 times younger than everyone, and it’s just a culture change honestly. There’s a whole lot of Latin Americans on the team, different than what I’m used to. Sidenote: I really like Jordan Groshans and think he's going to be a star. I mentioned him a bunch before the draft. I think Toronto has a great scouting & player development system and I'd like the Cubs to steal some talented scouts/instructors from that organization. Regular Show wrote: Sidenote: I really like Jordan Groshans and think he's going to be a star. I mentioned him a bunch before the draft. I think Toronto has a great scouting & player development system and I'd like the Cubs to steal some talented scouts/instructors from that organization. I don't really see this as being racist. He was talking about his transition from Oklahoma to Arizona. He’s been playing on elite travel teams since he was 13-14, so by his senior year of HS he is probably used to feeling like one of the older/more mature members of his team. Now after being drafted and playing with even more experienced players he’s back toward the bottom of the ladder. Also his community growing up was about 80% white vs 6% Latin American, so I could definitely see moving into a clubhouse that’s probably closer to 60-70% Latin as being a bit of a cultural shock. Yeah that's how I read it too. Unless there's more quotes not included, I think it's fine/whatever. If he's been tweeting racist horsefeathers then we have a problem. CaliforniaRaisin wrote: Jared Young and Erick Leal were named the July minor league player and pitcher of the month, respectively. Remember how we got Leal for Tony Campana? Classic. Now that's he's back from injury, how does he look as a prospect? I know he hasn't hit AA yet but his numbers are rock solid. Maples has struck out 27 batters in his last 11 innings. I think you just kind of live with the walks if he racks up Ks and GB like he is this year. He's probably a guy who won't truly click in the majors for another season or two but once he does he will put up top set-up guy numbers. This is the 2nd straight year he's striking out 15 per 9.